by Vincent J. Scully, Jr. This book has been widely acclaimed as the definitive study of the complex inspirations and cultural influences that were fused in the Shingle Style of wooden suburban and resort buildings of the period 1872 to 1889. 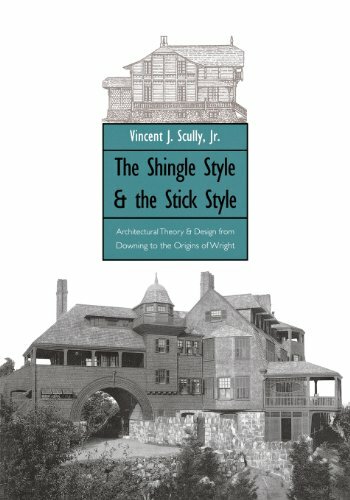 Vincent Scully presents the published designs and the written statements of the architects, as well as contemporary criticisms of the buildings to analyze the development of the Shingle Style from Richardson's early work to Wright's first house in Oak Park. An analysis of the Colonial Revival is central to the work, which is now enhanced by the addition of an extensive related chapter on the Stick Style of the mid-century. "Scully's research is exhaustive, his scholarship impeccable. His illustrations alone form a gold mine of information on the period." Vincent Scully's book features numerous houses built by Roberts & Hoare, Stephen R. Holt's great grandfather's firm. They were depicted in a series of sketches, shown here, by E. Eldon Deane in 1884.